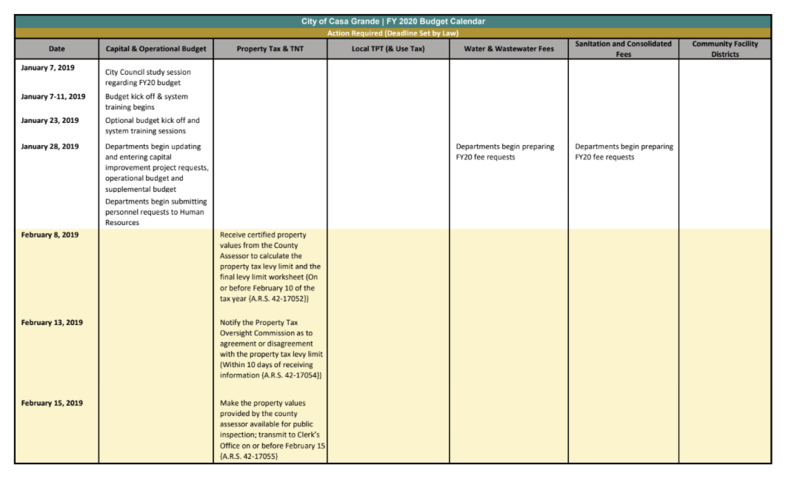 The City of Casa Grande prepares a city-wide budget each year to provide its residents with services such as police and fire protection, parks & recreation, sewer and garbage collection. As part of the budget process, the City Council reviews changes to the City’s consolidated fee schedule, which is a list of fees charged for certain services. City Council also establishes property tax rates on a yearly basis. The Capital Improvements Program (CIP) identifies capital needs of the community and indicates how these needs will be funded over time. In general, only projects that cost more than $100,000 and have a useful life in excess of 10 years qualify for funding in the CIP. The CIP is updated annually and is subject to change with each update. The City Council approves the budget and CIP in June. The City’s fiscal year begins July 1 and ends June 30 of each year. The budget is an ongoing process combining citizen input, Council vision and direction, and staff recommendations to meet community needs. The City of Casa Grande is required by law to adopt a balanced budget that is open to citizen input and participation. Each resident can have a voice in deciding what the budget will be spent on and how it will be paid for before it is adopted. -Attend a City Council meeting (first and third Mondays of the month at 7 p.m., 510 E. Florence Blvd.) and speak during the Public Comment portion. -Attend a Budget Public Hearing held during the City Council meetings in June at 7:00 p.m., 510 E. Florence Blvd.